Contemporaneous to perform original student compositions on Thursday at 7 p.m. The Contemporaneous Ensemble is a chamber orchestra based in New York City that will perform on campus on Thursday. They will perform work by student composers from Binghamton University. Some Binghamton University music students will have the opportunity of a lifetime this Thursday: to have their original compositions performed by professionals. The BU music department will be hosting the world-renowned Contemporaneous ensemble on Thursday, Jan. 24 in the Casadesus Recital Hall. 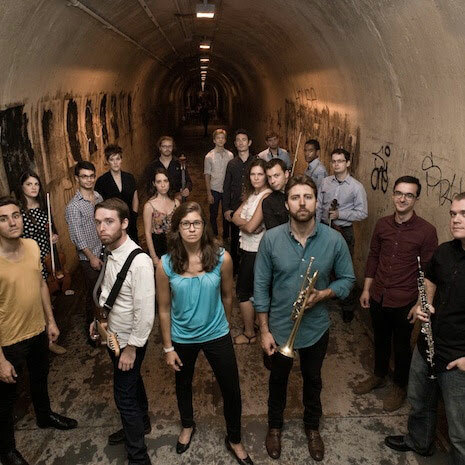 Contemporaneous, a 21-person ensemble led by co-artistic directors Dylan Mattingly and David Bloom, who is also the conductor, will be performing new works by Iranian composer Anahita Abbasi and American composer Philip Glass, as well as original compositions by BU undergraduate and graduate students. Bloom and his peers founded the group during their time at Bard College. The ensemble was created with the goal of promoting and performing the most exciting music of the present moment. With a passionate emphasis on educating other musicians, Contemporaneous travels to colleges and universities to practice and perform the original compositions of students studying in the music departments there, bringing to life the music of now. Fourteen BU students were selected to send original compositions to Bloom and his ensemble. After rehearsing the selected compositions, Contemporaneous musicians traveled to Binghamton to work alongside the students in order to achieve the vision that those students had in mind for each of their works. For Bloom, working with BU students is reminiscent of his college days as a music student at Bard. He said he is constantly inspired by their determination and novel approach to composing music. When Bloom is not conducting the ensemble, he works with well-known classical composers including Donnacha Dennehy, Lucy Dhegrae and Michael Gordon, and frequently works with artists outside of the classical world like David Byrne, Kimbra and Courtney Love. Though the ensemble frequently travels to different locations, Bloom said that their music will continue to be innovative and unifying — regardless of where they are performing. The Contemporaneous ensemble will be performing at 7:30 p.m. on Thursday, Jan. 25 in Casadesus Recital Hall.